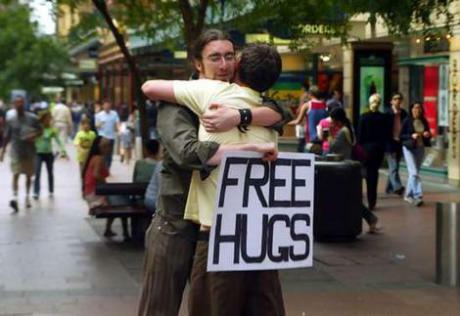 The Hugging Judge – Workaday experiences to cherish.. He began offering everybody a hug. His colleagues dubbed him “the hugging judge” (as opposed to the hanging judge, we suppose). The bumper sticker on his car reads, “Don’t bug me! Hug me!” About six years ago Lee created what he calls his Hugger Kit. On the outside it reads “A heart for a hug.” The inside contains thirty little red embroidered hearts with stickums on the back. Lee will take out his Hugger Kit, go around to people and offer them a little red heart in exchange for a hug. offering you one.” She accepted. How simple it is to make a difference in the lives of others. Previous postJust one of those days!